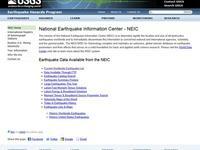 This is a very extensive site about earthquakes. The USGS NEIC site provides access to near real time earthquake data from around the world, as well as data for recent earthquakes (last 3 weeks). The site can also be searched for information on specific earthquakes by time or location. There is a General Earthquake Information section with extensive earthquake education materials as well as information on seismicity, earthquake magnitude, preparedness, predictions, and locations.